Tom Bridges is the newest member of the Board of Directors of the San Patricio Municipal Water District. Mr. Bridges was appointed by the board to represent the City of Portland and takes the place of Al Nelson who had served on the board since 1985 and resigned citing health issues. Mr. Bridges has been a resident of Portland since 1975 and served 23 years as District Attorney for the 36th District which includes San Patricio and Aransas Counties. He served as an Air Force pilot from 1962 to 1967. 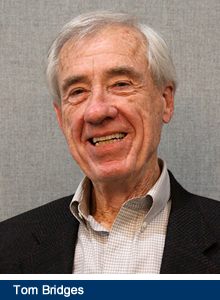 A 1970 graduate of the University of Texas School of Law, he started his legal career as a briefing attorney for justices at the Texas Supreme Court and later as an associate at a Corpus Christi law firm. He began his career as a prosecutor in 1974 as an assistant to Corpus Christi District Attorney William Mobley and in 1975 became a prosecutor in the office of 36th District Attorney John Flinn. Mr. Bridges currently serves as Municipal Court Prosecutor for the City of Portland and is a lecturer in prosecutor and law enforcement training. He and his wife Mary, a former Gregory-Portland ISD teacher, are owners of TompkinsYoung Real Estate in Portland. In his resignation letter, Mr. Nelson said it has been a pleasure to represent Portland and work with the District's board members and staff over the past 30 years. That included three board presidents and three general managers. "I cannot begin to describe the infrastructure improvements that have occurred at the Water District during my tenure," he concluded. The Water District is governed by an eight member board of directors. Seven directors represent member communities (Odem, Taft, Gregory, Portland, Ingleside, Aransas Pass and Rockport). The 8th director is appointed by the other members.